I’ve been hearing a lot about Rosco Levee over the last six months, so I was pretty chuffed when this review copy arrived a few weeks ago. 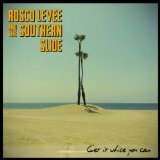 “Get it while you can” is the second album from Rosco Levee and the Southern Slide, following 2012’s “Final Approach to Home”. Coming straight out of the heart of the Medway Delta, Rosco, with Andy Hayes (guitars), David Tettmar (drums), Simon Gardiner (bass) and Lee Wilson (keyboards) play a joyous blend of blues, rock and country with a healthy dose of 1970s southern American rock, but more about that later. If you want great blues and blues/rock guitar players we seem to have dozens of them at the moment (here and across the pond) but, personally, I’m really fed up of hearing about the new Clapton, the keeper of the faith and the guardian of the flame. There’s no denying that Rosco Levee is influenced by the Allman Brothers and the Rolling Stones (and a few more), but there’s such variety on this album that it stands way above the work of the purists and the one-trick ponies. More importantly, it sounds like the musicians are having a great time. Before getting really stuck in to this one, I have to say that, on the first listen, I wasn’t too keen on Rosco’s vocals; maybe it was too early in the day. There’s a lesson here; never review anything that you’ve only listened to once because you’ve almost certainly missed something. After a few more plays, the lead vocals became original and distinctive with a hint of Freddie Mercury on early Queen albums or perhaps Squeeze singer Glenn Tilbrook. So the album starts the way great albums do, with a statement of intent in the blistering “Some Angels Fall”, which throws in everything from a big dirty guitar intro to a huge chorus with a horn section and a couple of kitchen sinks thrown in for good measure. The next two songs are similarly uptempo, the shuffle beat, keyboard-driven “Gambling Man” followed by “Howitzer Eyes”, powered by a bass riff and twin lead guitars before the first hint of a change of tempo. The next three songs feature Rosco’s acoustic guitar work, “Back to the Banks” adds a bit of piano and has a strong feel of the Stones’ “You Can’t Always get what you want”, “Whiskey Blues Goodnight” starts with acoustic slide and builds into a blues stomper while “My Gospel” has a strong feel of Rory Gallagher’s acoustic sets; the structure of the song’s very simple and it relies on great guitar and vocal performances. “When the Band Starts to Play” is a slow blues with an impassioned vocal building up to a huge finish with loads of backing vocals, while “I Got my Own Plan” is pure swamp rock. The final three songs, “Redemption Calls”, “Look Out Moses” and “Southern Belle” run through country, spaghetti western themes, Mexican brass arrangements, call and response, tempo changes and varied dynamics. This album quite clearly displays its influences, but it never feels derivative. The arrangements are hugely varied, from vocal and acoustic guitar to full band with keyboards and horn section, and it all works. It was even recorded direct to analogue tape in the studio by a bunch of people who just want to make great music. So what’s not to like? Released January 27 2014 on Red Train Records UK (Cat 427002).